The Scripting view allows you to edit scripts to run in Harmony directly from the application. It displays a list of available scripts, from which you can select an existing script, edit it, test it and save it. The Script Editor will highlight the syntax of your script for easy reading. From any of the other views, click the Add View button and select Script Editor. User: Scripts are saved alongside your user preferences. Those scripts can loaded, executed and edited in any scene, but only as the currently logged in user. Scene: Scripts are saved to the scripts subfolder of the currently opened scene. This scope is for scripts that should be used in the scene specifically, but should be available to any user that opens the scene. The list of script files. 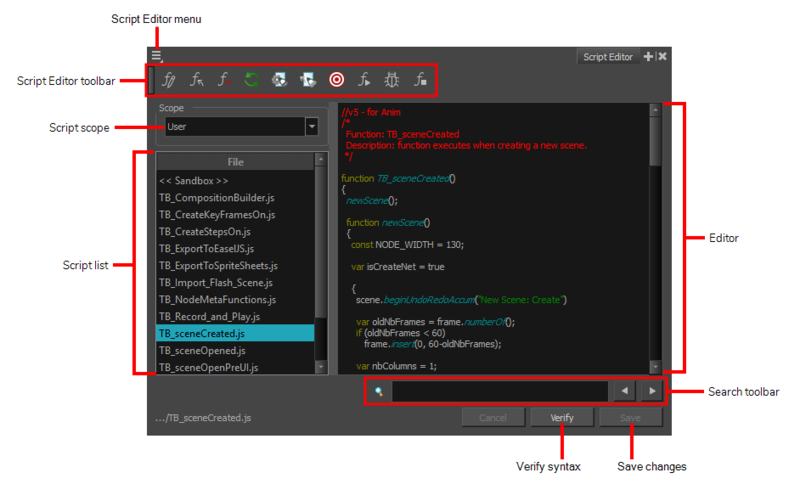 Selecting a script will open it in the editor and allow you to make changes to it. NOTEThe << Sandbox >> item at the top of the list does not correspond to an actual script file. It is a temporary container to type and test code, but changes to the sandbox will not be saved. A syntax highlighting text editor in which the script is loaded and can be edited. Allows you to search for a keyword within the script. Verifies that the script has no syntax error. Save the modifications to the script to its corresponding script file.